Definition at line 29 of file ScoreboardHazardRecognizer.h. const char * ParentDebugType = ""
Definition at line 30 of file ScoreboardHazardRecognizer.cpp. References llvm::InstrItineraryData::beginStage(), llvm::dbgs(), E, llvm::InstrItineraryData::endStage(), llvm::InstrStage::getCycles(), llvm::InstrStage::getNextCycles(), llvm::InstrItineraryData::isEmpty(), llvm::ScheduleHazardRecognizer::isEnabled(), llvm::InstrItineraryData::isEndMarker(), llvm::MCSchedModel::IssueWidth, LLVM_DEBUG, llvm::ScheduleHazardRecognizer::MaxLookAhead, and llvm::InstrItineraryData::SchedModel. AdvanceCycle - This callback is invoked whenever the next top-down instruction to be scheduled cannot issue in the current cycle, either because of latency or resource conflicts. 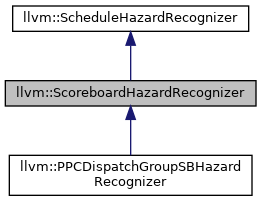 This should increment the internal state of the hazard recognizer so that previously "Hazard" instructions will now not be hazards. Reimplemented in llvm::PPCDispatchGroupSBHazardRecognizer, and llvm::ARMHazardRecognizer. Definition at line 229 of file ScoreboardHazardRecognizer.cpp. Referenced by llvm::ARMHazardRecognizer::AdvanceCycle(), and llvm::PPCDispatchGroupSBHazardRecognizer::AdvanceCycle(). atIssueLimit - Return true if no more instructions may be issued in this cycle. Definition at line 104 of file ScoreboardHazardRecognizer.cpp. EmitInstruction - This callback is invoked when an instruction is emitted, to advance the hazard state. 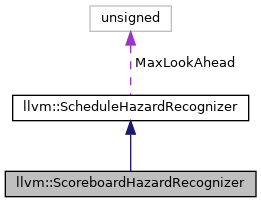 Definition at line 171 of file ScoreboardHazardRecognizer.cpp. References assert(), llvm::InstrItineraryData::beginStage(), E, llvm::InstrItineraryData::endStage(), llvm::ScheduleDAG::getInstrDesc(), llvm::MCInstrDesc::getSchedClass(), llvm::InstrItineraryData::isEmpty(), llvm::TargetInstrInfo::isZeroCost(), LLVM_DEBUG, LLVM_FALLTHROUGH, llvm::MCInstrDesc::Opcode, llvm::InstrStage::Required, llvm::InstrStage::Reserved, and llvm::ScheduleDAG::TII. Referenced by llvm::ARMHazardRecognizer::EmitInstruction(), and llvm::PPCDispatchGroupSBHazardRecognizer::EmitInstruction(). NoHazard: it is legal to issue this instruction on this cycle. Hazard: issuing this instruction would stall the machine. If some other instruction is available, issue it first. NoopHazard: issuing this instruction would break the program. If some other instruction can be issued, do so, otherwise issue a noop. Reimplemented in llvm::ARMHazardRecognizer, and llvm::PPCDispatchGroupSBHazardRecognizer. Definition at line 112 of file ScoreboardHazardRecognizer.cpp. References assert(), llvm::InstrItineraryData::beginStage(), llvm::dbgs(), llvm::ScheduleDAG::dumpNode(), E, llvm::InstrItineraryData::endStage(), llvm::ScheduleDAG::getInstrDesc(), llvm::MCInstrDesc::getSchedClass(), llvm::ScheduleHazardRecognizer::Hazard, llvm::InstrItineraryData::isEmpty(), LLVM_DEBUG, LLVM_FALLTHROUGH, llvm::ScheduleHazardRecognizer::NoHazard, llvm::InstrStage::Required, and llvm::InstrStage::Reserved. Referenced by llvm::ARMHazardRecognizer::getHazardType(), and llvm::PPCDispatchGroupSBHazardRecognizer::getHazardType(). RecedeCycle - This callback is invoked whenever the next bottom-up instruction to be scheduled cannot issue in the current cycle, either because of latency or resource conflicts. Definition at line 235 of file ScoreboardHazardRecognizer.cpp. The hazard state should be set to an initialized state. Definition at line 80 of file ScoreboardHazardRecognizer.cpp. References llvm::dbgs(), llvm::Depth, dump(), and LLVM_DUMP_METHOD. Referenced by llvm::ARMHazardRecognizer::Reset(), and llvm::PPCDispatchGroupSBHazardRecognizer::Reset().